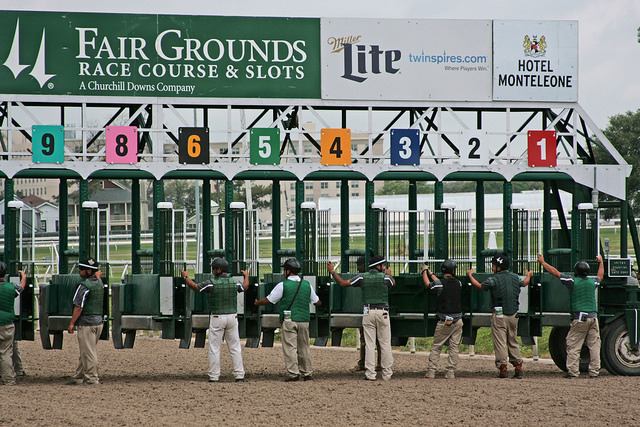 We return to the Fair Grounds for the final time this prep season with the 9 furlong Louisiana Derby — the first 100 point race of the season. The 100 points to win will definitely get you in, and the 40 points for second should do the same. So, you can go from off-the-radar to Kentucky Derby horse with a great showing in today’s race. With that in mind, let’s take a look at the contenders for today’s race — some, like Bravazo, which have likely already qualified. Bravazo (54 points): Draws the rail after a terrific outside run to win the Risen Star at 21-1. Does seem to be a new horse this year for the Cowboy D. Wayne Lukas. Both wins have been close — beating Snapper Sinclair by a nose in the Risen Star. He originally marked himself a contender with an Oaklawn allowance win and backed it up big-time in the Risen Star. The other two board finishers are back today, plus a decent new shooter, so he’ll need a top-notch effort. It’s worth noting that Lukas’ horses can be inconsistent and this horse has already qualified. Strong contender, but looking elsewhere. Snapper Sinclair (22 points): Comes off a very strong second in the Risen Star and adds Jose Ortiz in the saddle. He was 41-1 in that race. A second place finish again will stamp a ticket to Louisville. He’s been a much better horse since the switch back to the main track and gets his third route over the distance today. The extra half furlong is a question due to his City Zip/Yes It’s True sprint breeding — on paper, he seems suited to the Santa Anita hillside (and he did win a 7f on the turf at Kentucky Downs. He’s a contender with some questions. My Boy Jack (12 points): Shipped from the west coast to win the Southwest by 4 1/2 lengths at Oaklawn in the mud. Ships back from California for today’s challenge. He may be a “turf/mud” horse, so pay attention to the track conditions for today’s race. Once Keith Desormeaux gets them going off the layoff, he typically can keep them hot. That said, seems like a bet against off that big off-surface effort. Noble Indy (10 points): Another late developing Todd Pletcher trainee, he finished third in the Risen Star. He was two lengths back of the head-bobbing pair in that race. Take Charge Indy should help him get that extra half-furlong. He adds blinkers — something it’s hard to get a read on, but ITWT (in Todd we trust). Either 1st or 2nd get him into the Derby. I expect he’ll likely end up in one of those two spots. Lone Sailor (2 points): Hasn’t shown too much as far as winning on the Derby trail, with his best showing coming with a third in the Breeders’ Futurity last fall. That race was won by Free Drop Billy — high up on the Derby points charts — and the runner-up was Bravazo. He’d need a major step forward and might have to win to guarantee a stop in Kentucky. He’s a longshot worth looking at, especially depending on the pace, as he’s shown a propensity to close. Givememaminit (2 points): A Louisiana-bred who has been on the trail for a long-time, he finished third as a maiden in the Hopeful last summer. Seemed outclassed in the Risen Star with a 10-length loss. His best speed has come sprinting against Louisiana-breds. Even though Javier Castellano takes the mount, this son of the great Star Guitar may need easier than this. I’ll be passing. Of the rest with no points, Retirement Fund catches the eye if you toss his mud-run in the Southwest. He has the pedigree to get the distance and has shown a proclivity for the track. Hyndford ran second to the uber-impressive Magnum Moon in a Tampa allowance. That might be the most impressive company line for a new shooter — maybe in the entire race. Marmello is outclassed here as a maiden without the requisite speed. And, finally, Dark Templar would need a major step up, only just winning his allowance on the front end with a slow place. Analysis: Of the “point-less,” Hyndford has the most upside. And he’s worth a few bucks if the price hangs above 6-1. But the pick is going to be Noble Indy, as Pletcher’s stable rounds into form. But lots of choices in what should be a good betting race.